This week the university released a new website search appliance powered by new search technology. While the system is more robust on the back-end, one of our primary objectives and goals for the project was to ensure that front-end features and functionality for users would be streamlined. You can access the search from the global bar of any USD web page from any phone, tablet, or desktop computer device. 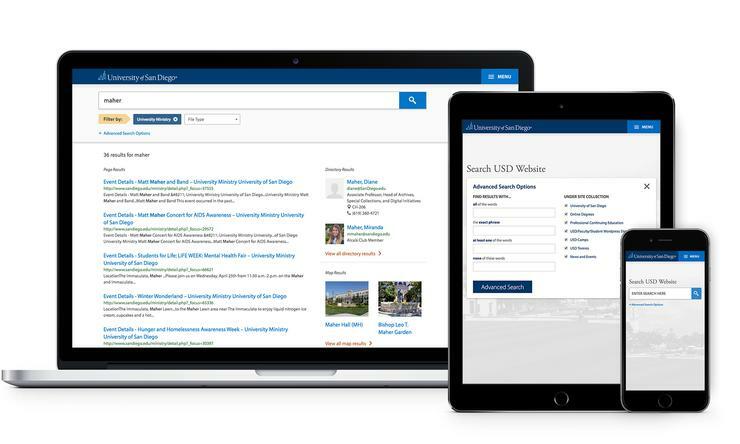 What this means for USD website visitors is an improved front-end, more targeted search results, and modular integrations from the USD directory and the USD campus map within the search results. Search results are now using a new algorithm which we believe will bring more relevant results to the top of search results. With that said, search is largely based on content, so the search engine crawls what is included in the website, which in some cases can be irrelevant or outdated material. We encourage all USD website maintainers to be conscientious about their website content and practice removing outdated content (including Word and PDF files) and updating content on a regular basis. We have also implemented featured search results in the new system, which allow us to pre-set a result for any specific search term. For example, searching for 'tuition' in the new search engine brings up a featured result pointed to the Tuition and Undergraduate Expenses website. This type of featured search can be set for any search term. The search results interface has also been completely streamlined. Largely dependent on Google branding previously, we've been able to redesign the search interface so that the results are easier to read and the modular content is contained within a right-hand panel. Special attention has been paid to make the search results equally readable and digestible on various devices including tablets and mobile phones. Have something you can't find? Have suggested featured results to submit? We want to hear from you. If you are searching from the global area of one of USD's academic websites, you will have the option of searching the general USD website or that specific school's website. Included in any search results are relevant directory and/or map hits for the specific term being search. For example a search for the term 'maher' reveals page, map, and directory hits. We are planning to include additional integrations in the future so that this can become a one-stop search landing point for public-facing systems at USD (that is, those not behind a single sign-on screen). The old search interface included left-hand filters. These were links and only one could be selected at a time. The new search appliance includes robust filtering where you have the option to mix and match your search results and further refine your results based on school, site, news/event, and/or file type. The search interface also includes an advanced option for refining your search process further based on a specific combination of words or searching within a specific portion of the USD website. The Google Search Appliance, which powered our search technology in the past, was sunsetted when the vendor announced it would no longer be providing search solutions. When this announcement was made, the web team began a process to research, test, and decide on a new search approach. Ultimately the outcome of this process was the purchase, configuration, and rollout of SearchBlox technology. SearchBlox is an enterprise search solution built on the popular Elasticsearch engine. As the heart of the Elastic Stack, it centrally stores data so you can discover the expected and uncover the unexpected.